Uncontrollable Glee: This is the best. 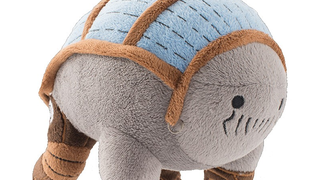 Mass Effect fans are already fond of the alien Elcor, a race of massive creatures that preface all of their sentences with an emotion to convey tone (they also make great Shakespearean actors) — but I can almost guarantee they’ll be even fonder of this adorable plush version. For those unfamiliar with Mass Effect, The Elcor are a race of quadrupeds that, among their own kind, use scent and subvocalised infrasound to communicate and convey emotion — but to other races, their voice comes out as a flat monotone. When interacting with other species, they make up for the lack of emotion by prefacing every one of their sentences with an emotional state. All of this, of course, is compounded by the fact that we’re talking about a heart-cloggingly adorable plush toy. So when you squeeze it and it says something like “Affectionately: I love you.”, you’re guaranteed to melt into a pile of d’aaw-ing goop. God dammit, so cute! The Talking Elcor is available now from the Bioware store, for $30. I’ll take 5, please.